Science behind Alzheimer's disease The most common form of brain impairing disease and the third killer of humans has its own story of development. Recognizing the danger zone! It is true that our knowledge could protect us against Alzheimer's disease. Sooner we start to move out of danger zone, stronger we will be protected against it. 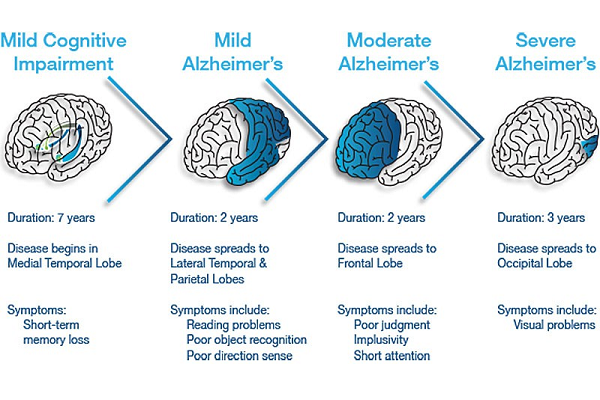 What Alzheimer’s Does to The Brain! Posted on December 1, 2017 by NOAL Posted in Welcome	. Accumulation of the protein aggregates is the leading cause of cellular dysfunction in neurodegenerative diseases. In physiological situation, the protein misfolding is sensed by the cellular control systems as a threat to the survival of neurons, which will be followed by an immediate neuronal response. Any delay to detect the misfolded proteins, may result in neuronal deterioration and progression of neurodegenerative disorders. Alzheimer’s disease (AD), the most common form of dementia among the elderly and the third leading cause of death in adults is associated with two main lesions, both as a consequence of protein aggregation: extracellular plaques made of beta-amyloid (Aβ) and intracellular neurofibrilary tangles (NFT) made of tau protein. Although the process of neuronal death is a common feature in Alzheimer’s disease, underlying mechanisms are still under investigation. In this scenario, Aβ and Neurofibrillary tangles are considered as the main neurotoxic proteins to initiate neurodegeneration. Stop Alzheimer’s Before it Starts! Posted on September 22, 2017 by NOAL Posted in Welcome	. Till the time that a breakthrough could be found to cure Alzheimer’s disease, the chance of having it after 85 is almost 50% (1 in 2 people). While most of the current researches are focused on finding a cure, after developing the symptoms, it’s getting more clear that applying preventive strategies must begin long time before the pathology of disease reaching to the stage of presenting clinical symptoms. In 2016, around 700,000 Americans at 65 or older died with Alzheimer‘s disease, which many of them died because of Alzheimer‘s disease’s complications. Therapeutic strategies usually don’t change the disease progression, especially when it is considered that the brain is already severely damaged by the time of starting treatment. some of the drugs have even shown the serious side effects such as brain inflammation. That indeed highlights the importance of applying preventive methods and strategies, ways before developing clinical symptoms. A recent paper in Cerebrum Journal has described the 4 main preventive strategies for Alzheimer’s disease. It seems that choosing a healthy life style is the only way that we have currently to live a long life and going to a healthy aging with no fear of Alzheimer’s disease. Khalsa D. and Perry G. The Four Pillars of Alzheimer’s Prevention Cerebrum 2017 cer-03-17. Posted on August 6, 2017 by NOAL Posted in Welcome	. Alzheimer’s disease is the most common reason for the death of brain cells due to a brain disease. The life expectancy is considerably increasing all around the world, and with that the incidence of Alzheimer’s disease, the main neurodegenerative disorders during aging. The prevalence of AD is growing from 25 million in 2011 to an estimated number of 50 million in 2030, with only 5 % of the entire cases have a genetic predisposal background. The disease was explained for the first time, by German neuropathologist, Alois Alzheimer, while he showed the unusual presence of some fibrilar structure in the brain of her patient, Auguste Deter, after death. Further studies on the brain of patients with Alzheimer’s disease after death, revealed the accumulation of some proteins in the form of aggregates. That includes two major proteins of beta-Amyloid (Aβ) and phosphorylated tau peptide in the form of cellular tangles, known as neurofibrillary tangle (NFT). These two peptides now are considered as the main signatures of Alzheimer’s disease. Postmortem tissue sample from an AD patient brain reveals AD pathology including amyloid-beta plaques and Tau tangles (Photo credit Dr. Shohreh Majd). In 1984 Glenner and Wong reveled the structure of Aβ as the main component of senile plaques. This discovery led to beta amyloid cascade hypothesis, suggesting Aβ deposition as the first trigger for AD pathogenesis and generating its other hallmarks such as NFTs, neuro-inflammation, synaptic loss and eventually a massive neuronal death This hypothesis was supported by the fact that the amyloid precursor protein (APP) gene on chromosome 21, is mutated in many cases of familial AD. Besides, mutated forms of PS1 and PS2, enhances Aβ production from APP, and were suggested as the main trigger of AD pathology in the other types of familiar AD. Since Familial and sporadic AD shared the same pathological hallmarks and clinical manifestation, and because of that, Aβ cascaded hypothesis has been used to explain the pathogenesis in both types of AD. Numerous studies suggested a dominant role for tauopathy as the upstream initiator of AD pathogenesis. Hyperphosphorylation of tau as a microtubule associated protein reduces its glue-like ability to bind the globular elements of actin to each other to form acting tubular structure. Instead hyperphosphoryalted tau, clumps and build up NFT , the second AD hallmark, inside the cells. Co-presence of NFTs, neurodegeneration and memory impairment in animal and human studies and high level of correlation between p-tau in AD patients’ cerebrospinal fluid (CSF) and the disease progression have brought more evidence to support tau hypothesis as the other convincing explanation for AD pathology. The progressive nature of this disease slowly kills the brain cells, which starts from the centre of memory, hippocampus. The damage will spread to the other brain regions and impairs the thinking and analyzing skills of the patient. Most of the patients begin to show the symptoms in their mid-60s with continues progress of disease condition. In the end stage of disease the brain shrinks significantly, as it has lost many of its cells and the patient would requires a constant care as carrying out the normal daily activities, even the simple tasks will be impossible. Familial Alzheimer’s Disease (FAD, also known as early onset), usually before 60 (usually between 50-60) and includes 5% of the total Alzheimer’s cases. In FAD mutation in one or more of three genes (amyloid precursor protein (APP), presenilin 1 (PS 1) and presenilin 2 (PS 2)) is the underlying cause for AD pathology. The consequence of either of the mutations increases the accumulation of beta amyloid (Aβ) peptides in an aggregated insoluble form of senile plaques, a main hallmark for Alzheimer’s disease. Sporadic AD (SAD) contains 95% of all AD cases and has unknown etiology. SAD pathogenesis probably made of a combination of different genetics and environmental factors, such as (but not limited to) aging, hypertension, hypercholesterolemia, APOE ɛ4, smoking, diabetes and head injury.